Dr John Conger of Lipscomb University contacted me in January explaining that he was bringing a group of American students to London on a study abroad trip. He explained that his specialty is in child development and that he’s teaching Urie Bronfenbrenner’s Ecological Systems Theory of Development. He asked me to guest lecture on raising cross cultural children as a non British mother bringing up children in a country and culture I myself didn’t grow up in. Emails were exchanged, the date and topic set, and all I had to do was prepare the lecture and work out the logistics for getting to London for the 8am class. I was actually thrilled that this professor, who only knew about me from my website, had asked me to guest lecture. It was a fantastic thing for me to do and I enjoy helping and talking to fellow Americans about my experiences. During the class I was struck by how much things have moved on in the world of education (since I was at college). Most of the students had laptops out in front of them, we barely had the use of computers let alone laptops when I was a student! And there was a point during the discussion when someone said “can we Google it?” Oh how times have changed! I also realized while answering their questions that I am completely at home here in England, more than I sometimes like to admit, and that at the same time, I’m still very American in my thinking and in the way I bring a different set of values to my family. It was a thoroughly enjoyable morning with a wonderful group of young people. I’m thankful that I was given such an amazing opportunity to share my experience with Americans who are not only discovering England for the first time, but who are studying sociology and the influences parents from different cultures have on their cross cultural children and how that enhances their lives. Feeling at home in Britain but retaining your American identity? 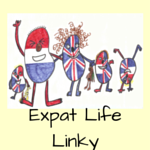 Sounds like you have this expat thing completey sorted out! Congratulations on your lecture – what an honour! !